In case you have no idea what I’m talking about, go read part one of the bathroom makeover. Here’s the bathroom after I was done. Notice the matching cabinetry. Mom did a great job picking a blue for the walls; I find it hard to select appropriate blues. It’s hard to get one that’s not anemic while avoiding one that borders on neon. If you’re interested, for this project we used paint from Lowes. Almond Paste is the wall color in most of the room. Skyward is the name of the lovely blue, and the cabinets are (I think) – Mocha Twist. 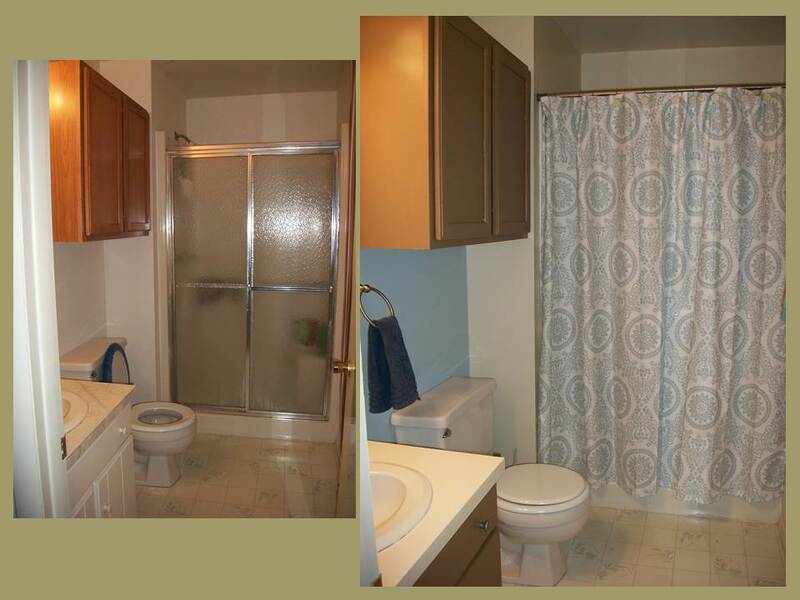 I like what the shower curtain does for the room by making it feel more soft and diffusing the blue of the accent wall throughout the room. Plus, since there’s not much wall space in this bathroom, there’s not much chance for wall art. 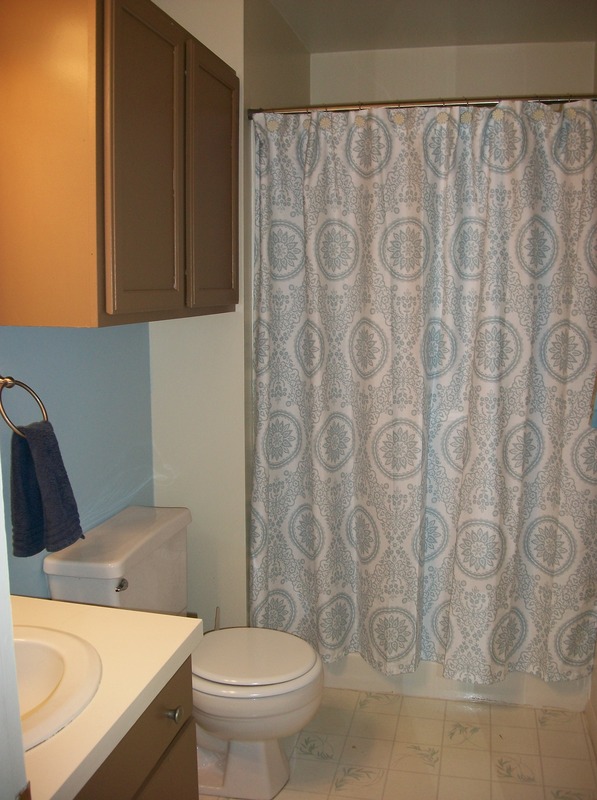 A pretty shower curtain has to carry the weight of visual impact. I didn’t get pictures of it, but I also made a simple blue curtain (not included in the 48 hours). Now that you’ve had a moment to take it in, let me show you some of the smaller projects in the room. Dad and I had quite the task before us to get the entire bathroom done in a day. Well, ok, I will admit that I didn’t get started until about 9:30. I hope HGTV doesn’t make their stars get up first thing in the morning to be on set. If they do, then I hope the hott carpenter wants to enjoy morning iced coffees with me. Mom’s dog had a grooming appointment I had to chauffeur her to in the middle of the day, so I was working around that time frame. Before dad and I left the house, he took down the old light, removed the ghastly tiles above the mirror, and spackled over the general mess produced. I took the cabinet doors out to the front porch and primed them, primed the cabinet boxes and got the first coat of mocha paint on the boxes. Painting the cabinets — or more specifically the side of the base cabinet closest to the toilet — was probably the worst part of the job. As I was crunched between the cabinet and the toilet, I kept repeating to myself, “I love my mom. I love my mom. I love my mom.” And that helped me get through — well, that and knowing that I had used some Lysol wipes that were under the sink to wipe down the toilet. On my HGTV show when stranger’s toilets are involved, the hott carpenter will need to remove the toilet from the room. Maybe we can put it on the client’s front lawns with a flower pot in the bowl and a hidden cam just to gather the neighbor’s reactions while we work. Yeah, I like that – a show that makes toilets funny. Also, I will remove the toilet plunger from the workspace. I was too lazy to get a paper plate from the kitchen so I could put the plunger outside the bathroom without it being on the carpet (ew, gross). So, I kept moving it around the bathroom as I worked. At one point, as I was crunched beside the toilet to paint, I felt something poking me in the sternum. I was like, “What in the world…” BLEH! I realized in my rush, I hadn’t move the plunger, so I was being assaulted by it. Yes, the plunger and the toilet definitely need to be removed on the show. That was about all that I was able to get done before leaving the house with the dog. Dad and I bounced back and forth between Lowes and Home Depot to get a new light, the supplies for the vanity and the mirror project — yep, there was a mirror project. Hold your horses, I’m getting to it. The hott carpenter will need to be able to handle that under pressure I get confused. I made us go to Home Depot since I momentarily forgot that I had bought the paint at Lowes (we needed access to the paint chips). At least I got to check the lighting section in both stores; I’m typically pretty obsessive about checking both stores when it comes to buying tile, lighting, etc. We had a late lunch while we were out. And to make a medium length story no longer, it was after 5 before we got home! Mom is supposed to get off work at 8:00. Once home, and I started to feverishly paint the first coat on the accent wall while dad sorted out what was going on with the light. When I was done with the first coat of Skyward, we went out to the garage to cut the frame for the mirror. Ready for the mirror reveal? The idea to frame out the mirror was Pinterest inspired – albeit a more simple form of the pin. 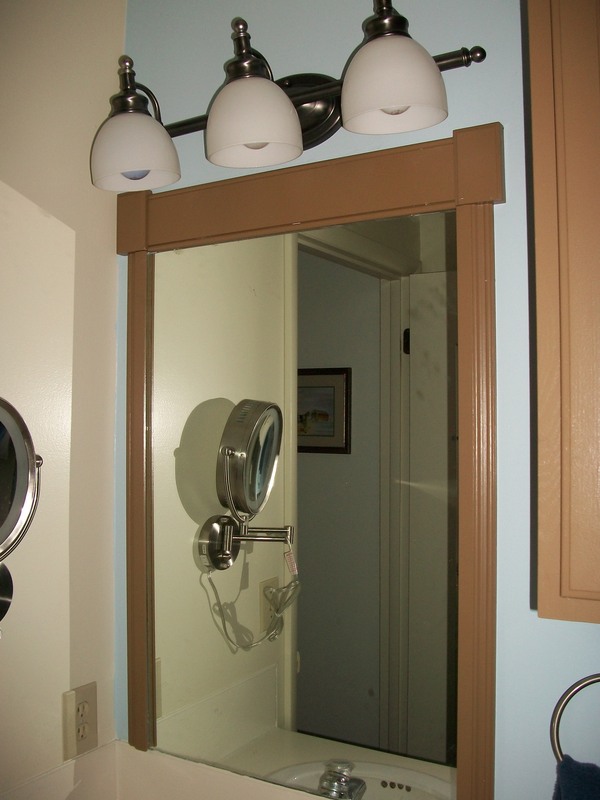 If you’re interested in doing this, I recommend using wainscoating trim for the sides of the mirrors. There is a channel already routed out of the wood, so dad and I didn’t even have to remove the original mirror clips holding the mirror in place. We put the trim up (after I feverishly applied two coats of paint to it) and tacked it right into his place with the air nailer (or whatever that thingy is that attaches to his air compressor and holds me in spellbound terror as it shoots out nails). We put the frame up after I had gotten time to paint the second accent wall coat of paint. And, somewhere in there, I was also trying to get paint on the cabinet doors out on the front porch because they couldn’t be in plain view when mom came home. The day was overcast, so we were losing workable light quickly. Dad and I got the light installed before the project ground to a halt. Then, the race began. I started sputtering to him, “Towel ring…help with shower curtain rod!! !, switch plates back up, put tools away.” It was crazy. In the meantime, I texted mom a brief grocery list of items to bring home so we could stall for more time. The bathroom finally came together except for the vanity project. Dad said to do the reveal without it, but I desperately wanted to paint it. 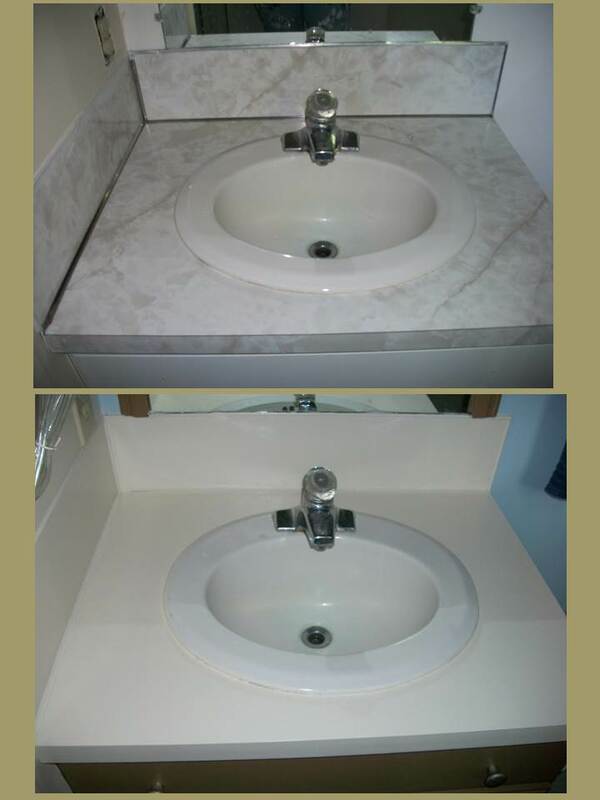 We wound up choosing to go with Rustoleum’s Countertop Coating, which is designed to cover laminate countertops. Originally, we went into Lowes seeking out garage floor epoxy since I read online that someone used that to cover her countertops. But during a debate about how to tint the epoxy at the Lowes paint counter, the associate asked what I was doing with it (in retrospect, she probably did think I was nuts for being so particular about what color to paint the garage floor). When I told her that I was painting a vanity top, she recoiled in horror as if I’d just revealed a homicidal plot. She led us to Rustoleum’s product. I’m still holding my breath to see if it actually holds up; there was one spot on the metal tracking that I just could not get it to cover for some odd reason. I definitely don’t recommend it if you’re an inexperienced painter. I’ve been painting home interiors since I was in junior high (no lie), and I was having trouble getting a smooth evenly rolled coat because the paint, even though it says satin finish, has a glossy sheen. Also, if you’re pregnant or bothered by strong smells, I’d definitely advise strongly against using this product since the odors from it are pretty noxious even with an open window nearby. If you want to spend less than $25 to take a shot at updating a countertop and have the necessary painting experience, then for right now, I’d say go for it. Below is the before and after to help you decide. So, did I actually get everything done within 48 hours. Well, no. I did have to go back in to put a second coat on the vanity top and to paint the trim work in the bathroom, but I got very close to completing everything in that time frame. HGTV, you can send me hott carpenter audition photos whenever you are ready. 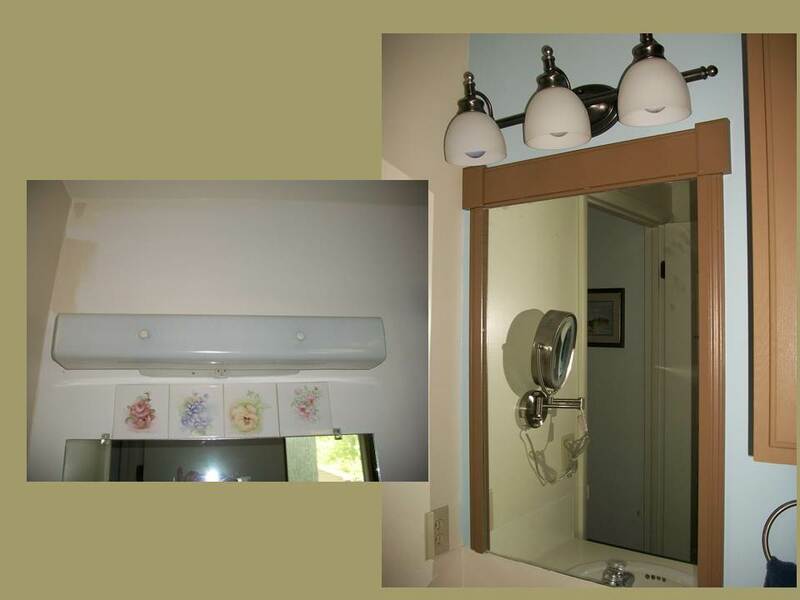 This entry was posted in decorating, home improvement and tagged decorating, home improvement. Bookmark the permalink. Nice job! Love the paint colour.